Swimming and a good end to week one of the taper! So the theory goes that tapering is all about winding back the distance so you don’t hurt yourself before the race whilst uping the tempo a little to push yourself and reinforce the neuromuscular pathways you will be using in race…. 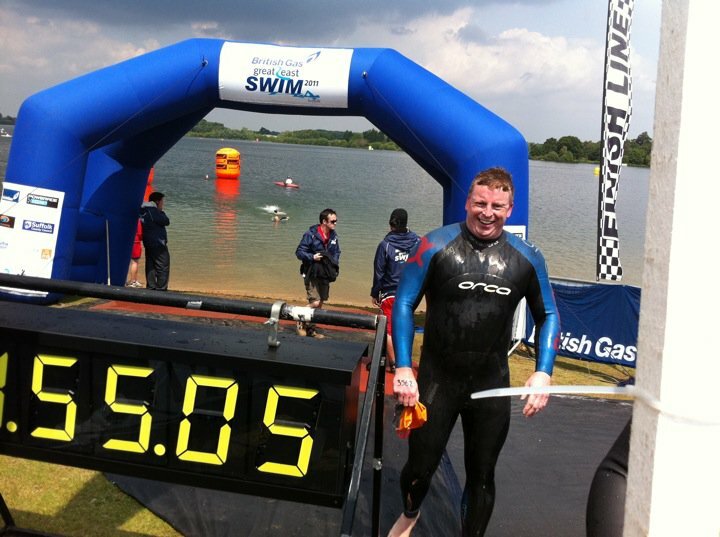 Wind forward to yesterday morning and we (the family) arrived at Alton Water for the GES, my first competitive swim since I was racing Masters pool swimming during my PhD – nearly fifteen years ago! The onsite organisation was a bit of a cluster – lots of tents and signs for spectators but a lack of direction to the start….anyway I eventually found it and waited to be logged in. Our warm up time arrived and we got into the (frankly tiny) patch (about 10mx10m) of water to try and warm up – we had a whole resevoir why such a small warm up area???? I kept waiting for more orange hatted people to turn up for our wave but we ended up with most of the 60 entered in the wave – apparently I had entered the top Age Group (AG) wave – the next wave was the elites….as far as I know I was the only triathlete there all the others were OW swim specialists…oh dear, this could be a disaster I thought…..we had an “interesting” warm up led by a fitness instructor and the starting klaxon was set off (by the German chap who came 2nd in the elites). Prior to the race I had not really thought about the difference of swimming races vs triathlons that much, i.e. in a triathlon the klaxon or gun starts the time for everyone, in this OW race the time started when an individual went over the timing mat – hence I could have waited at the end and gone over on my own and into clear water, but I didn’t instead I was in the second row and sprinted in to the water. A short session of aqua-ruck later I was in clear water and heading for the second buoy. After a pretty uneventual swim – which involved a fair amount of drafting two other swimmers and trying not to kill people from the previous wave (who were soooo slow and just appeared from nowhere doing breaststroke….) I rounded the last buoy and headed for the exit chute. In a triathlon I would have controlled my pace a little more and thought about T1 from about 400m out but this was a straight thrash for the end (and it shows on the video) – I jumped up onto my feet as soon as my fingers hit the bottom and sprinted for the mat – over the line in 24:44! Sub 25mins is a pretty good time for an OW 1 mile race to give some idea I was 38th overall out of 1285 swimmers, 32nd Male and 4th in my Age group (and gender), all without specific training for the race – I guess if I get bored with triathlons I could always make a go of racing OW swimming!!! A good day’s work! Very happy and slightly surprised!! So why is this blog post not just entitled – a good swim? Well this morning I did a turbo 10mile time trial, basically a 25min warm up and then flat out for 16km of the last section of the Marshman route. My previous best for 10mile TT was 27:42 this morning I managed it in 26:01 🙂 Okay it was the turbo but I have it fairly well dialed in for accuracy as I managed 535W max/237W av and HR 186 max/162 av which is pretty close to what it should be!! So there you go – taper 2/52 done – two swims, three turbo sets one rest day and a race – DONE! Next week is the final taper week to UK 70.3 IM in Wimbleball – turbo x2, swim x2 and 1 road session to test the bike. Also I have my mid week test run – my biggest fear…..why well three weeks ago I put some small tears in my Achilles tendons and I have been icing/ultrasounding/resting them as much as possible – if they are not 80% on Wednesday then Wimbleball will be a swim/bike and probable/planned DNF on the run….it was my A race but it is now my B race with Ireland 70.3 as my main focus….fingers crossed. Finally if you find this interesting and want to sponsor my efforts please go to http://www.justgiving.com/Iaindoesthreehalfironmanracesin2011 and donate some money for the Urostomy Association – they helped my mother – a really worthwhile cause!! Swimming and the impact of a two week layoff…. So following my VO2max on Sunday yesterday was a 30min run @ 6:10/km pace (2hr 1/2 marathon pace), the legs did not want to run….but I still managed to keep the to the target pace (in fact towards the end it was becoming easy!). CD: 50 Easy – put stroke back together, finish with good form. Not sure what happened – warm up and drills good but it all fell apart the 4x400s ranged from 5:48 to 6:05 no consistency, the first one felt really easy (5:48) and I could not slow down it just felt good, number two and three (5:54, 6:01) were both okay but gradually harder and by number 4 I was gone (6:05) breathing was off (inhaled water – I never do that), turns were sloppy and my stroke was falling apart…..I am guessing it is the lack of swimming for nearly two weeks that has blunted my longer distance endurance….ho hum….at least on the positive side I finally built my single speed bike (42/18 gearing – see the previous post) so I will be using that a lot more for chores and maybe a couple of training rides – just to make my one local hill a little harder!